During her Winnipeg residency Beinda Griffiths looks at how women artists balance the often conflicting demands of motherhood and professional art practice. I was offered the opportunity to spend a few weeks during June 2014 in Canada with arts organisation MAWA. The city of Winnipeg, Manitoba, located almost in the centre of the vast Canadian continent is notorious for its long harsh winters, mosquito infestations in summer and its self-deprecating humour. It is also, I discovered, well regarded for its active artist community. MAWA (Mentoring Artists for Women’s Art) was launched in 1984 as a response to the lack of opportunities for women in Winnipeg’s arts community. 30 years on it continues to provide opportunities for professional development and local and international networking. MAWA selects four artists annually for their international artist residencies, hosting them at various times throughout the year. The organisation provides the artist with an apartment and, if needed, a separate studio. The aim is to allow the artist the space and freedom to develop and further their practice in any way they need to. As I have a young family it was important to me that I bring them with me on the residency and MAWA was really open to that. Our apartment was a light filled open plan space above MAWA’s main centre. From the apartment window you looked down onto Main Street, a busy road that runs straight through Winnipeg. A short bus trip on the No11 bus drops you off right outside The Winnipeg Art Gallery - also known as the WAG. I had been told about an exhibition called “7: Seven Professional Native Indian Artists”. The exhibition showcases works by a group of professional Indian artists (founded in November 1973) who stimulated a new way of thinking about contemporary First Nations people, their lives and art. While there I also noticed an installation called “This, That, Those” by Winnipeg born artist Micah Lexir. Micah has an interest in order, numbers, the kind of marks we make every day and the presentation of those marks. Now living in Toronto, his work blurs the lines between artist and curator. I found his ideas refreshingly simple and the arrangement of the elements of his work oddly compelling. My studio was located in the historic warehouse neighbourhood called the Exchange District, a short walk from the apartment. The walk along Main Street also takes you past Martha Street Studio (a printmaking studio), the Winnipeg Museum, The Winnipeg Concert Hall and a great little café called Parlour. The studio space is provided to the artist by a partnering organisation called aceartinc., a non-profit artist run gallery which includes studio, project and gallery spaces. 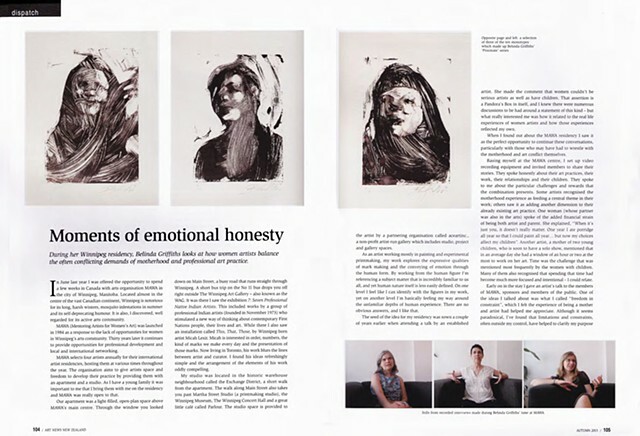 As an artist working largely in painting and experimental printmaking, my work explores the expressive qualities of mark making and the conveying of emotion through the human form. By working from the human figure, I reference a subject matter incredibly familiar to us all, and yet the human nature itself remains such a mystery. On one level I identify with the human figure in my work, and then on another level I am basically feeling my way around the unfamiliar depths of human experience. There are no obvious answers, and I like that. The seed of the idea for my residency had been sown a couple of years before when attending a talk by an established artist. She made the comment that women couldn’t be serious artists as well as have children. A Pandora’s Box in itself, I knew there were numerous discussions to be had around a statement of this kind – but what really began to interest me was how it related to the real life experiences of women artists and how those experiences reflected my own. When I found out about the MAWA residency I saw it as the perfect opportunity to continue these conversations, particularly with those who may have had to wrestle with the motherhood and art conflict themselves. Basing myself at the MAWA centre, I set up video recording equipment and invited members to share their stories. They spoke honestly to me about their art practices, their work, their relationships and their children. They spoke to me about the particular challenges and rewards that the combination presents. Some artists recognised the motherhood experience as feeding a central theme in their work; others saw it as adding another dimension to their already existing art practice. One woman (whose partner was also in the arts) spoke of the added financial strain of being both artist and parent. She explained, “When it is just you it doesn’t really matter. One year I had porridge all year so that I could paint all year…but now my choices affect my children” Another artist, a mother of two young children (soon to have a solo show) mentioned that on an average day she had a window of an hour or two at the most to work on her art. Time was the challenge that was mentioned most frequently by the women with children. Many of them however also recognised how spending that time had also become so much more focussed and intentional - I could relate. Early on in the stay I had done an artist talk to the members of MAWA, sponsors and members of the general public. One of the ideas I chose to talk about, which I felt the experience of being a mother and artist had helped me appreciate, was what I called freedom in constraint. Although it seems a bit of a paradox, I have found that limitations and constraints, often outside of my control, have helped to clarify my purpose as an artist and enhance my creativity. This concept becomes as relevant to me in how I approach my art practice as it has been in the smaller details. For example, it has been my practice for a several years to use a limited paint palette in my work. I feel like it effectively gives the mark-making side of my work a playground, but one with boundaries. It creates a tension which right now is so much more interesting to me than endless possibilities in colour. In the lead up to my residency, I had also become increasingly interested in using my time for both collecting the video reference as well as time spent creating in the studio. Something about the idea of adding a time constraint into the already heady mix of new visual stimulus and unknown variables appealed to my art making process. At night I would review the footage from the interviews and select video stills which I wanted to reference for a series of portraits. I froze moments of emotional honesty; doubt, vulnerability, conviction and pride. It was images like these that I took with me to the studio. With the rare prospect of uninterrupted hours on end in the studio I was keen to work on something relatively experimental. Some months before I had played around briefly with creating monotypes with open acrylics. I had brought some basic art materials with me but there was an art shop within walking distance to the studio with a good selection of paper. I chose to work in the workshop instead of the studio space and made the most of the long benches and the good natural light. After working directly with the paint onto an acetate plate, I would transfer the image to paper with a hand roller. Working in this way I could achieve the raw, gestural qualities that I wanted. After an intense but rewarding couple of weeks I displayed the ten portraits at MAWA’s main centre. It felt right to me to be able to share something of my work and process with those who had shared so much with me. Once the residency was completed and keen to experience as much of Canada as possible, we continued our travels. In Montreal we took in the Montreal Jazz Festival. In Toronto we visited the Art Gallery of Ontario and saw the Henry Moore, Francis Bacon ‘Terror and Beauty’ exhibition. As well as the impressive sculpture that Moore is known for, the exhibition displayed concept sketches that gave an interesting insight into his work process. I was especially excited to see Francis Bacon’s painterly portraits in real life, a far cry from seeing them in print. A quote of Bacon’s on the wall as I left the exhibition seemed particularly relevant; “The greatest art always returns you to the vulnerability of the human situation.” In each city we tried to alternate between visiting the big flashy art galleries and the smaller artist-run spaces in the slightly grittier suburbs. When the kids reached their gallery limit for the day there was always the large variety of street art and sculpture to view as we walked the streets. For our last week we hired a car and drove over the Canadian Rockies, finishing off in Vancouver. It may have been the time we stayed there or perhaps the people we had the opportunity to meet – but Winnipeg with its offbeat charm had been a definite highlight. A sentiment echoed by the women I spoke to. The support of organisations like MAWA and the local arts community seems to nurture a creative freedom which allows artists in Winnipeg to just get on with the job of creating regardless of what the outside art world may or may not be doing, and while still negotiating the balance (or the chaos!) that day to day life brings. Back in New Zealand I’m recognising that it is that very same chaos - birth, death, love, loss - which “returns us to the vulnerability of the human situation.” The alternative, the notion of the ‘serious artist’ working away in isolation, without commitments or responsibilities, only ever emerging to suit themselves, seems more like a myth to me. I’d like to suggest that the ‘serious artist’ is one who is committed to the chaos, whatever form it takes, and can’t help but create amongst the fray.